My obsession with microbes began the first day I was handed a vial of E. coli, my flimsy lab coat the only thing between me and the bacteria that made newspaper headlines. After I was reassured several times that it wouldn’t kill me, I sat down at my lab bench and couldn’t believe my eyes. Looking through the microscope lens, all I saw at first was a big pink blob. As my eyes adjusted, I realized that it was thousands of little blobs, and these creatures were alive and seemed to float before my eyes. This fascination led me to pursue a degree in microbiology, of which I knew nothing about at the time, and I spent the next few years learning to appreciate the complexity of our microscopic world. I began to respect the human body in ways I had never imagined, like how over 80 percent of our immune system is located in our gut, or that we have 10 times as many microbial cells as we do human cells. These microbes that live in our intestines play such huge roles in our wellbeing and there are hundreds of different species of yeast, bacteria, Archaea and even viruses. It’s truly mind boggling how these creatures evolved along with us throughout the eons so that we couldn’t survive without them. They’re intimately involved in our mental and physical health and rely on complex chemical communication systems. That’s why I became skeptical when I heard that you could go to the grocery store and simply buy a jar of bacteria neatly packaged into a probiotic pill. Today, nutritionists recommend a certain strain of bacteria for one illness and a different strain for another. There are special formulas for men versus women, and there are strains for kids and infants. The microbiologist in me cringes every time I look at shelves full of expensive pills. Somebody is making a lot of money off these supplements, but are they really worth it? Nine million probiotics per pill sounds like a lot…but it’s really not. Our gut contains trillions and trillions of microbes. A pill has what, several million or even billions of probiotics? While that sounds like a lot, it’s just a drop in the bucket compared to the unimaginable quantity of bacteria and yeast living in our gut, so a pill will have very little effect in the long run. They are often destroyed by stomach acid. Our stomach acid is super strong and essentially destroys the microbes in a pill form. There’s nothing in a pill to protect the microbes from damage so they don’t even make it to your intestines where they would do their good work. Very low diversity of species. You’ve heard the saying that variety is the spice of life, right? Well, that’s especially true when it comes to the microbes living in our gut. There are thousands of different species of microbes and the more diversity of different species we have, the stronger our gut is. They are only a short-term solution. In certain people, probiotic pills are a great place to start. If you struggle with yeast or bacterial infections in the gut, pills can help balance the ratio of bacteria to yeast without causing severe side effects. In people with compromised immune systems or small children, for example, pills can have immune regulating effects and can strengthen the gut before moving on to more serious sources of probiotics. 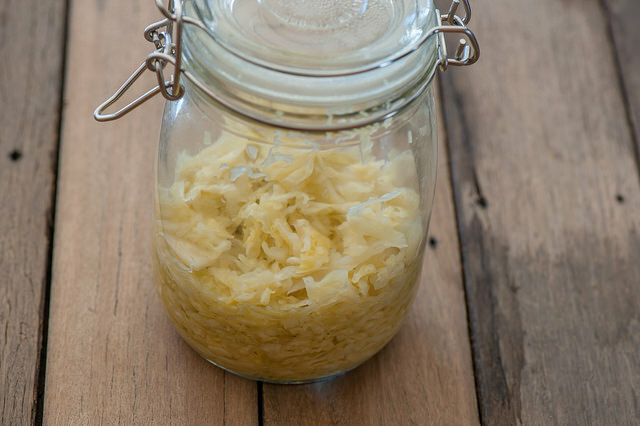 Fermented Foods: More bang for your buck. Yogurt, sauerkraut, kimchi and kombucha are all examples of foods that have been fermented. Fermentation is a processes where beneficial microbes eat the sugar found in foods such as dairy or vegetables, and produce acids and alcohols as a byproduct, helping naturally preserve the food and prevent spoilage. These foods are also packed with live probiotics, more so than any probiotic pill. One serving of fermented foods contains more probiotics that are found in a pill, there’s a wide variety of bacteria and yeast, and the probiotics are more protected from your stomach acid. This is a great way to eat probiotics if you’re still not ready to dive into more powerful foods like sauerkraut. And it’s an easy way to get your kids to eat probiotics too! If you’re buying it from the store, just be sure to buy plain, high quality yogurt that contains live strains of bacteria. Unfortunately, many yogurts in the store do not contain live bacteria, so they’re virtually useless. Fermented vegetables are probably the tastiest way to get your daily dose of probiotics. You can naturally ferment pickles, carrots, onions, and so much more. Fermentation is the most ancient form of food preservation. Before refrigeration, people fermented foods to make them last. The microbes in these foods produce acids that kill bad bacteria and prevent the food from spoiling which is how people living in cold climates were able to eat vegetables year-round. Northern European countries are known for their fermented kraut and kvass because they couldn’t get fresh vegetables during the long winter months. Kefir is like a drinkable yogurt—it’s fermented milk, but it’s more liquidy than yogurt. It’s also packed with powerful probiotics, more so than any other fermented food. If you’re looking for the most bang for your buck when it comes to fermented foods, choose kefir. Most people who are dairy-intolerant can drink kefir; the microbes in kefir break down lactose and casein proteins, making it easy to digest. This includes sugars, grains, oils and other refined foods. These feed microbes that will make you sick, increase your chances of obesity, cause skin problems, digestive issues and more. 2. Eat fermented foods and probiotics. Fill your gut with beneficial microbes that will fight off bad microbes and reduce inflammation throughout your body. Eating probiotic foods everyday will ensure you constantly have a thriving gut microbiome. 3. Eat foods that feed good microbes. You already know that bad guys like to eat processed foods, but what do the good microbes eat? They love leafy greens, colorful fruits and veggies and fibrous foods like legumes. Eating these foods everyday will ensure those probiotics have something to eat when they finally land in your gut. The next step? Incorporating fermented foods into your diet could be the answer if you’ve taken probiotic supplements in the past without any results. Add some kefir to your next green smoothie or sprinkle some kraut on your salad—your microbes will thank you for it! Hi. I really appreciate all of the good info on ways to eat your probiotics but I found I was very distracted by your generalizations at the first part about the pill form. I think this article would be more powerful if you just focused on ways to get it thru foods than trying to generally put down the pills, which vary greatly brand to brand and by dosage. Hayden Smith is studying Micro/Molecular Biology and is working on a Masters in Holistic Nutrition. 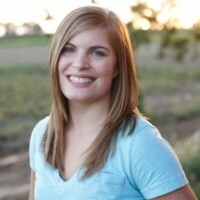 She works on her family’s small farm in Oregon with people who desperately want to feel better. Hayden believes real food + microbes are the best medicine and she teaches traditional cooking techniques to people who are excited to overcome their digestive disorders and feel like rock stars. She’s currently working on an online course that will give everyone the power to heal themselves.